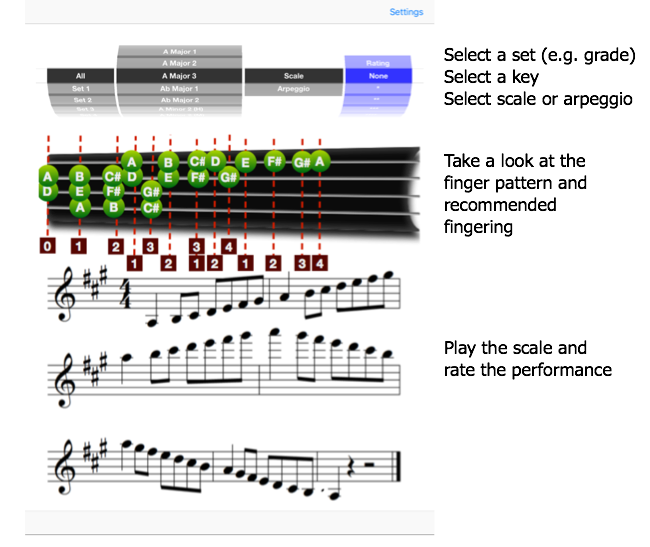 Violin Fingers is an app for iPhone and iPad that helps you learn scales and arpeggios on the violin up to grade 5 (including chromatic, harmonic and melodic minors, dominant and diminshed sevenths). Violin Fingers has a simple interface as shown below. The app is very simple and intuitive to use. The scales can be organsised in up to 5 sets (e.g. for grades 1 to 5). The scrollable lists at the top allow selection of grade, key, and scale or arpeggio. The required scale is displayed along with a picture of the fingerboard with the recommended finger pattern for the scale. This means the scale can be played immediately by following the finger pattern and the pattern can be associated with the notes in the scale itself. Each scale can be rated from 1 to 5 stars. This allows you to track progress on scales and target scales that need more work. 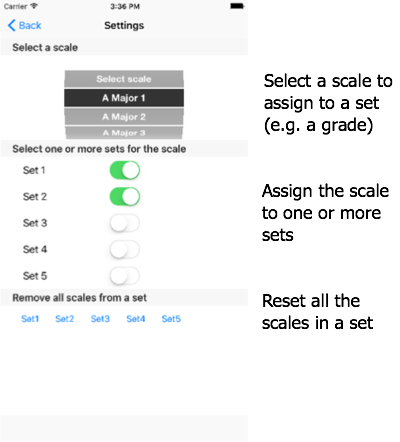 You can also ask for a random scale or arpeggio to be displayed - either from a list of all scales or from a specific grade. This simulates exam conditions and helps to prevent a focus on "favourite" scales. The random option is always the list option in the list of keys, which makes it easy to flick the key scoller to hit the last option which will then jump to a random scale or arpeggio for that grade. OK so what are my options here?